Results for the first half of 2012 have been solid and are roughly on the same level as last year. 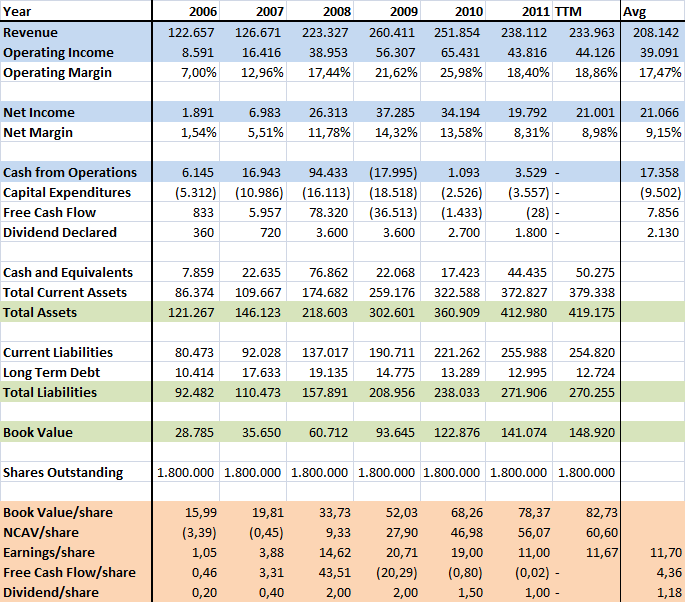 The Interim Report did not include a cash flow statement, and it’s a bit too much work to try to piece it together from the income statement and the balance sheet, but although the cash balance is growing the liquidity position of the company is not improving. Short term debt went from €37.7M to €52.2M and the net cash position from the company went from -€6.3M to -€16.7M. Positive is that the order book is still growing and is now standing at €700M versus €600M at the start of this year. Conduril has currently €100M worth of projects in Portugal (just 14%), €380M sits in Angola (54%) and €220M of orders are in other foreign countries (32%). The company scored new orders in Congo and Senegal this year: two countries where Conduril has not been active before. This entry was posted in Portfolio and tagged CDU.LS on October 11, 2012 by Alpha Vulture. Hi, would you care to share where one can find the interim reports of Conduril? Thank you.